Egg quality encompasses multiple criteria (eggshell quality, yolk color and composition,etc.) and can have economic implicationsfor layer producers. 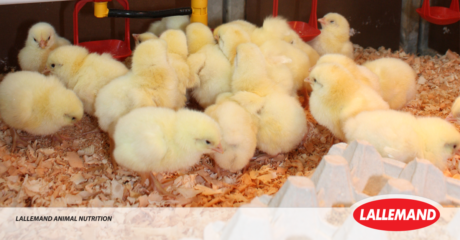 As egg quality is strongly related to hens’ nutrition, let’s see how a probiotic can help improve egg quality and represent a safe and natural tool to enhance egg production. BACTOCELL® (Pediococcus acidilactici MA 18/5M) modes of action have been well documented. These are translated into beneficial effects on laying performance. In addition, several trials indicate benefits on egg quality. The most economically significant benefit is the probiotic’s effect on eggshell thickness and relative weight. Various trials, performed under different rearing conditions show that BACTOCELL supplementation results in lower downgraded eggs rates (Figure 1). In the Polish trial1, the number of broken eggs has been reduced by half and shell-less eggs have been reduced by two-thirds. The authors also measured 8% higher calcium retention in the supplemented group (p=0.064). Eggshell is made of around 38% calcium. It could thus be hypothesized that the probiotic, through its positive effect on the digestive process, increases calcium assimilation, which is translated into thicker, stronger eggshells. Probiotics benefits do not stop at the shell. Various research trials have shown that egg biochemical parameters such as yolk pigmentation or yolk cholesterol content can be managed with BACTOCELL supplementation. The effect on cholesterol, interesting in terms of consumers’ health and acceptance, suggests an implication of the lactic bacteria in lipids metabolism. It is possible that probiotics could assimilate the cholesterol present in the gastrointestinal tract for their own cellular metabolism. Altogether, these data indicate a real added benefit for BACTOCELL on egg quality and production valorization, in addition to laying performance. 3Denev S. at al., 2013. 10th JRAs, La Rochelles, 26-28th March 2013.